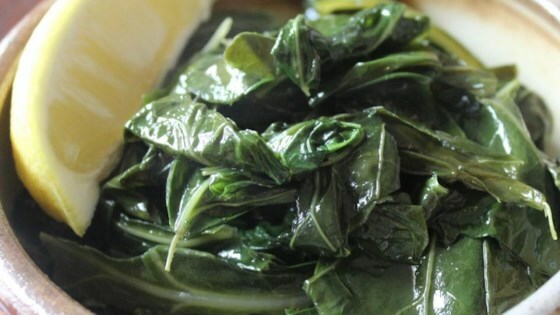 The RIGHT WAY To Cook Greens! "There's a short way and a long way, so no excuses will be accepted for tough, bitter greens!" Heat bacon drippings in a cast-iron skillet over medium heat. Add the greens. Stir-fry, I suppose, since you are stirring and frying, for 1 to 4 minutes (depends on how tough the greens are) or until greens are limp, tender, and have greatly reduced in size. Pork fat is good because it helps cover the bitterness of greens while bringing out their great flavor. At this point, you have a choice. Either serve them straight from the pan with a sprinkling of salt, or add 3 to 4 cups of water and salt to taste, and boil the greens 1 hour for extra tender, probably-won't-even-have-to-chew greens. If you don't have teeth, clearly you see which way to go here. See how to make big-flavored Southern greens. Original recipe calls for "a mess" of greens. A mess of greens is about as many greens as you can cram into a plastic shopping bag. To get drippings, fry 4 to 8 strips of bacon in an iron skillet or frying pan until you have gotten most of the grease out and it thickly coats the bottom of the pan. KEEP IN MIND: If you boil them without frying first, you will have to boil for at least two hours with some type of pork to reduce the bitterness of greens in general. My father boils his all day with a ham hock, and they turn out pretty good, but there is no need for that type of time commitment unless, of course, you have an unbreakable family tradition or sadly have no teeth (no judgement here, toothless ones)! I used this recipe before and I am about to use it again. How simple! I added crumbled bacon and diced onion- wonderful! Thank you! My first greens making experience went well bc of this recipe.